Nestled away from busy highways and urban noise and crowds, Pound Ridge is a picturesque rural town treasured for its rolling hills and scenic country roads. Its hamlet, known as Scotts Corners, features several dining options and quaint boutiques. 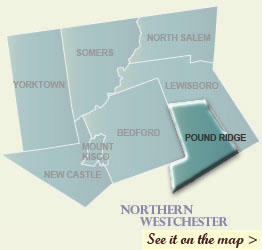 With the largest park in the county, the 4,300-acre Ward Pound Ridge Reservation, and the public course at Pound Ridge Golf Club, Pound Ridge provides a laid back, relaxing retreat for visitors and locals. Scotts Corners: the designated “commercial district” features restaurants and shops. The Pound Ridge Library: The cultural center of the town, housed in the former schoolhouse, offers events for children and adults. The Mianus River Gorge Preserve: The Nature Conservancy’s first land project is partially located in Pound Ridge. The Town Park: Offers playgrounds, picnic areas, and playing fields.